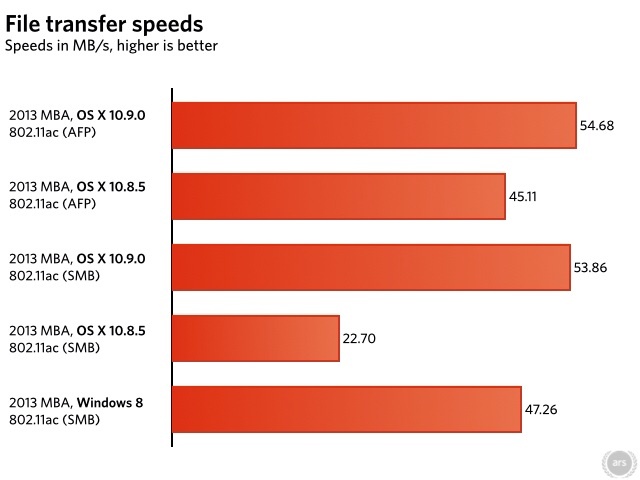 Apple has fixed 802.11ac SMB transfer speeds with the release of OS X Mavericks, reports Ars Technica. Back in June, it was discovered that the new MacBook Air's 802.11ac Wi-Fi performance was being artificially limited by OS X. Apple was not dynamically scaling the TCP window size. With the release of OS X Mountain Lion 10.8.5, Apple fixed the issue for AFP file transfers over 802.11ac; however, the problem still remained for SMB transfers. Two big takeaways here: first, AFP transfer speeds have improved even more since 10.8.5, on the order of about 21 percent. Second, SMB transfer speeds have finally been fixed—these numbers show a 137 percent increase, well over double the transfer speeds that were possible before. SMB is now on par with AFP speeds. You can see the test results in the chart below.